Most of the traffic lights installed about 10 years ago in 10 different locations in Kathmandu don’t work these days. The problem has caused major headache in traffic management and it has also increased the possibility of accidents in the busy intersections. Although these lights work now, if they are not properly maintained, they will also face the fate of the previous ones. Regular maintenance of traffic lights should be made a priority. While the traffic lights at the busy interactions are not working and they are not repaired, the traffic police is in a hurry to demand more. 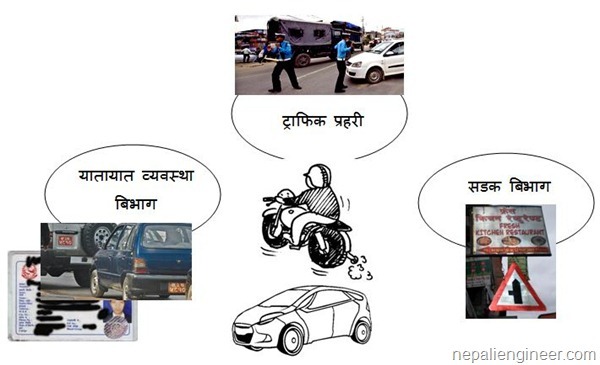 The traffic police has demanded traffic lights in 19 more intersection in Kathmandu. UPDATE – On the day this post was posted online news site onlinekhabar.com published a news about a death of a 19-year-old motorcycle driver while traffic police tried to stop it for check-up at Sallaghari, Bhaktapur. The witness of the accidents told that, the accident happened while avoiding hitting the traffic police who had stepped in the road to stop it. This entry was posted in Problems and tagged DOR, DOTM, Roads, Traffic Lights, Traffic Police, Traffic signs. Bookmark the permalink.